I feel at home, I'm making friends that I will keep forever. 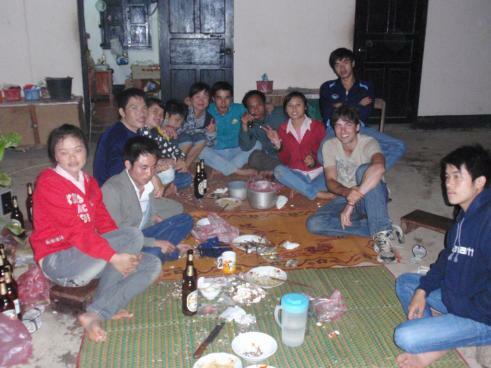 That's the thing about Laos, you feel like you have family in every town. I'm making family in each part of the world. I met Lucky through couchsurfing, and he showed me around Vientiane and invited me to his house to have some drinks with his friends and family. He lives with his family, and helps them tend their vegetable garden. There does not seem to be such a class system here, what's important to them is spendng time with family and friends, eating meals together almost every day, playing games, laughing. Lucky showed me some Laos pop music videos, and they were the cheesiest production I have ever seen. So cheesy, but that made them great! Pop music reigns in Asia. I had my first encounter with a ladyboy the other day, she was our travel agent. They are people in Laos and mostly Thailand, that were first men and now they are women. It's very hard to tell. I only knew because my friend, Inigo, that I'm travelling with told me, that's a ladyboy. 2 days ago I rented a bicycle and got lost in Luang Prabang. I happened to see a sign that said Laos coffee out the corner of my eye. Lenou owned the shop and we proceeded to talk for 3 and a half hours. Lenou is 26, only 3 weeks difference in age with me. We have went through the same kinds of emotional and experiential journeys in our lives at the same times! He invited Inigo and I to dinner. His mother made buffalo and other Laos delicacies. His friends all had a great energy about them. His friend who sat next to me had read The Power of Now twice. Who knew I would meet people in this small, poor SE Asian country of 6 million people, who have read The Power of Now? I guess I should know. I always meet great people. I always have and I always will. I talked with Lenou about how we could get tourists and travelers to come outside of the "tourist bubble." He loved my idea for my travel company. Because with the current way, a few people benefit from the travelers who just stay in one particluar street or part of town. What about the others? They aren't benefitting from the dollars, so he wants a way that will give travelers a more authentic and local experience. I know I will see Lenou again, perhaps work with him. He said "we don't know the future, but it will be good."